Fiscal year 2015 is history. And revenue collections during the year never lived up to expectations. After general fund income dropped dramatically in FY 2014, the governor and too many lawmakers still held out false hope that receipts would rebound in FY 2015. Instead, the Kansas revenue stream stayed at the same low level, even while revenue estimates remained too high. Kansas officials estimate future revenue twice a year, in November and April. 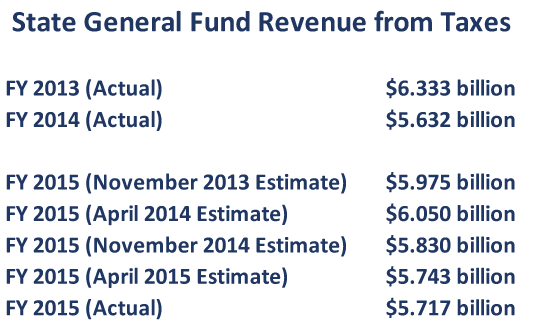 The first official estimate of FY 2015 tax revenue, done in November 2013, predicted receipts of $5.975 billion. Then, in April 2014, at the start of an election season and two months before FY 2015 actually began, the estimators used incomplete and inadequate information from the Department of Revenue to revise their predictions slightly up to $6.050 billion. The estimators should have lowered their forecast at that point. Within a week of the estimate’s release, it became clear that income tax revenue was tanking and would not reach the expectations that had been set. Nevertheless, that April 2014 estimate stayed in place all through the election season, allowing the fiction to persist that Kansas might have enough revenue to fund its budget. One week after the election, the falseness of the earlier estimate was exposed when estimators revised the FY 2015 revenue forecast down to $5.830 billion. Even that was not low enough. By April 2015 the estimate was lowered yet again to $5.743 billion. And, when FY 2015 finally ended 2 months later, the final tally underperformed even that low expectation by $26 million. So where are we now? In FY 2013, Kansas had post-recession tax revenue that exceeded $6.3 billion. In FY 2014, the full impact of unaffordable tax cuts hit home, dropping the Kansas revenue stream below $5.7 billion. FY 2015 tax revenue stayed at that same basic $5.7 billion level, far less than the amount Kansas needed to fund its budgeted expenses. Kansas only survived the fiscal year by cleaning out its reserves, moving money from the highway fund, and shaking the couch cushions to find any other available cash in the balances of other funds. Although the income tax policy that caused all the problems remains in place, sales and cigarette taxes go up in FY 2016. With the tax increases, FY 2016 tax revenue is predicted to rise to $6.2 billion. It probably won’t actually reach that level, but even if it does, that’s a $6.2 billion revenue stream against a very conservative set of expenses already totaling nearly $6.4 billion. And the bank account is empty. 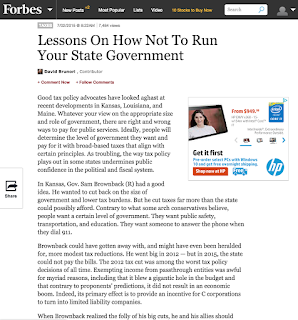 The 2012 tax policy has crippled Kansas financially. 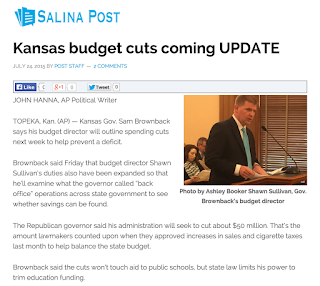 In the future, revenue will have to increase in order for Kansas to just meet minimal obligations.